Apple gets a lot of flak for their lack of customization on their devices, but hey, at least you can move your apps around on your iOS device—that's customization, right? Well, you couldn't even do that on your Apple TV—until now. The newest Apple TV 5.1 software update released earlier this week added the ability to move apps and icons around the interface. The video above is actually from last June during a beta release of the Apple TV update. In order to get this new feature, make sure you update your Apple TV to 5.1 by going to Settings -> General -> Update Software and wait for it to find the update. Then click on Download and Install. Select the icon to move. Press and hold "Select" on the remote. When the icon jiggles, move the icon to a new position. Press "Select" again to finish. Though you can move apps like Netflix around, you can't move any of the items on the top bar (Movies, TV Shows, Music, Computers, and Settings). 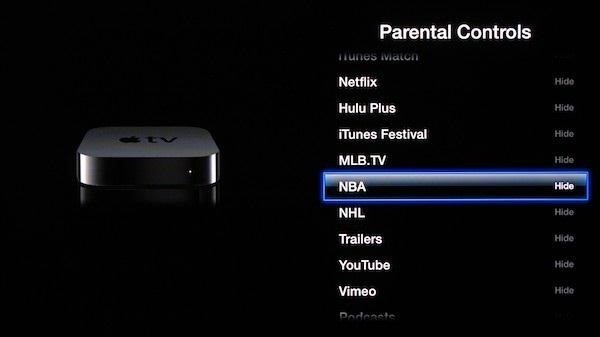 Go to Settings -> General -> Parental Controls. Scroll down and pick either Show or Hide where wanted. Check out the Apple support page for a list of all the features and requirements.